In their recent Living Planet Report for this year, the World Wildlife Federation is suggesting that this planet's resources won't be enough for us. The Earth’s biocapacity is the amount of biologically productive area – cropland, pasture, forest, and fisheries – that is available to meet humanity’s needs. 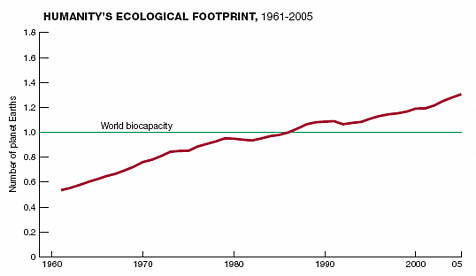 Since the late 1980s, we have been in overshoot - the Ecological Footprint has exceeded the Earth’s biocapacity - by about 25%. Effectively, the Earth’s regenerative capacity can no longer keep up with demand – people are turning resources into waste faster than nature can turn waste back into resources. A moderate business-as-usual scenario, based on United Nations projections of slow, steady growth of economies and populations, suggests that by 2050, humanity’s demand on nature will be twice the biosphere’s productive capacity. "We moved our world to a tenth of a light year's distance, keeping the primary only as an anchor. We needed the farming worlds and it would have been dangerous to let our world wander randomly through space. Otherwise we would not have needed a sun at all." "We had brought suitable worlds from nearby systems, increasing our agricultural worlds to four, and setting them in a Kemplerer [sic] Rosette." Of course, an alternative to finding and developing additional planets and their resources would be to more intelligently and conservatively use the resources of the one planet we have.